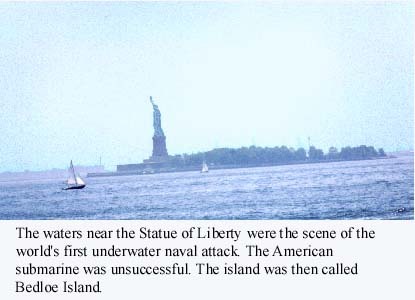 The small island is now known around the world for its Statue of Liberty, but during the Revolutionary War the nearby waters held a very different creation that would also change world history. The first submarine attack occurred near what was then known as Bedloe Island. Sgt. Ezra Lee was in a machine created by David Bushnell. It was made of oak timbers. It had windows on top and lead weights in the bottom. Lee could raise or lower the craft by allowing water into the bottom part of the submarine or pumping it out. He had a crank to paddle the boat forward, and a compus with foxfire on the needle so he could see it in the dark. Most importantly, he had a 130-pound keg of gunpowder that he hoped to fasten to an enemy vessel by drilling into the hull. When he launched his attack in August of 1776, he could make three miles an hour toward the British fleet. While he successfully submerged and got under a British ship, he couldn't apply enough pressure to the drill to penetrate a copper plate on the bottom. He eventually had to retreat as dawn approached. He was spotted and chased in a small boat by British sailors on Governors Island. Lee cast off his cask of gunpowder and the British, suspecting a trick, withdrew. The primitive torpedo was armed with a clock and rifle lock. When the clock reached the appointed time, the flint struck steel and the cask blew up in the East River, spraying water for a great distance. Lee tried again on Sept. 5 in the Hudson River off upper Manhattan, but was spotted and had to flee. 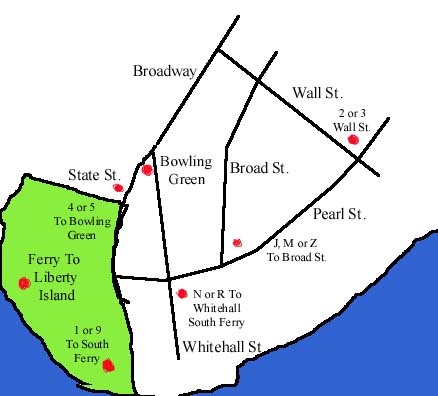 Address: New York Harbour, off the Battery. Hours: 9:30 a.m. - 5 p.m., open for extended hours during the summer, closed Dec. 25. Phone: (212) 363-3200 (recorded message), (212) 363-7620 (school group reservations), (212) 363-6304 (fax), (212) 363-6307 (library).. Admission: Free, Round trip ferry tickets cost $7 for adults, $3 for children and $6 for senior citizens.